Eventually the story threads & possibilites became so inexhaustible that they were collapsed back into the original superhero arena that we know today. At the time it seemed as if the whole idea was prompted by the DC writers saying, "Wouldn't it be cool if...". I bring this era of superhero stories up due to its relevance to what happened in the World Cup yesterday. 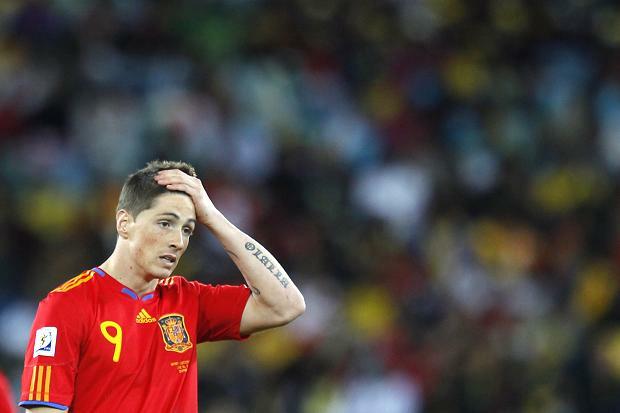 In what is the biggest shock of the tournament so far, European Champions and competition favourites Spain, were beaten 1-0 by the unfancied Switzerland side. And while the result itself is noteworthy, it's the potential ramifications that should make you sit up and take notice. For those of you who have been playing close attention to your World Cup wallcharts, Spain's defeat looks like it could completely change the likely make-up of the rest of the competition. And while players & coaches have to publicly spout cliches like "We're taking one game at a time" and "There's no easy opponents at this level" (that's not a criticism by the way, it's just the nature of any industry that's under close media scrutiny) you can bet that in their respective camps, the leading contenders already have half an eye on the tournament's latter stages. Us fans do it all the time. Let's not forget that every player & coach used to be a fan themselves. They wouldn't be involved in the game otherwise. So while many pub discussions have involved England's potential route to the final or why Holland's side of the draw rules them out of contention, you can bet that the players have done the same (Here's an embarrassing confession - before one World Cup, I predicted every single result and wrote the scores on my wallchart in pencil, only going over them in biro when the actual matches were played. Not for money or anything like that, just because I could. Told you I had too much time on my hands). But I digress. Spain's defeat means that there is a strong chance that they will fail to finish top of Group H, and you can be sure that those four sides scrapping it out next door in Group G are dreading this outcome. The team who finishes top of G will play the runner-up of H. Before the tournament began it's likely that the players of Brazil, Portugal & maybe even The Ivory Coast thought to themselves, "Win the group, avoid Spain, and we're as good as in the quarters. Simple"
Well that simple route looks to be drifting off into the distance. Now that Spain are expected to finish no better than second, the seed of doubt has been planted. Do the Group G sides even want to finish first now? Is it preferable to go into the knockout stages in your best form or should you try to avoid the bigger names for as long as you can? Whichever decision is made, the mental wallcharts in the training camps of Brazil, Ivory Coast & Portugal are being revised and re-drawn. I hope they used pencil. This one result in Durban could have far reaching implications for the rest of the World Cup. We may see an intriguing clash between the competition's best two sides, Brazil and Spain, as early as the last 16 stage. The dynamic has shifted and all of us pundits have been made to look quite foolish. Switzerland took our respective crystal balls and smashed them along with Spain's expectations of taking 9 points from 9. Like the aforementioned DC writers, it was as if the gods of football looked down from upon high and said, "Hey, wouldn't it be cool if we mixed things up a little in this World Cup? How about... stay with me, a bit crazy I know, but what if Spain were to lose their first match. Wouldn't that be kinda cool"?